Did I mention it was drizzling here, so much for the long range forecast which made me go out and buy sun cream, more likely to get rust than a sun burn! And now see what the forecast says!! Silly boy I am last night I stayed awake until 2 am listening to the commentary of the Ireland rugby match on my iPhone. It wasn't even worth listening to! So this morning I slept on a little and the rest were half way through their breakfasts. It was a Sunday and our last free day before the work starts on the workshops. To be honest we didn't do too much just wandered around looking at the sights. Thankfully most of the museums closed early or Brian would have dragged us around a load more. Getting used to the streets and being able to walk between the cars and motorbikes. Also it didn't drizzle all day, it didn't get sunny, but we didn't get wet at least. Tonight we will have another look at the night market and then go for a meal. We are being collected at 8am in the morning to go to the hospital which I think is about 45 minutes away from our hotel. Looks like it will be a busy days. As we sat having a cup of coffee we watch these balloon sellers who sold their balloons in the middle of the traffic with cars and motorbikes whizzing around them. 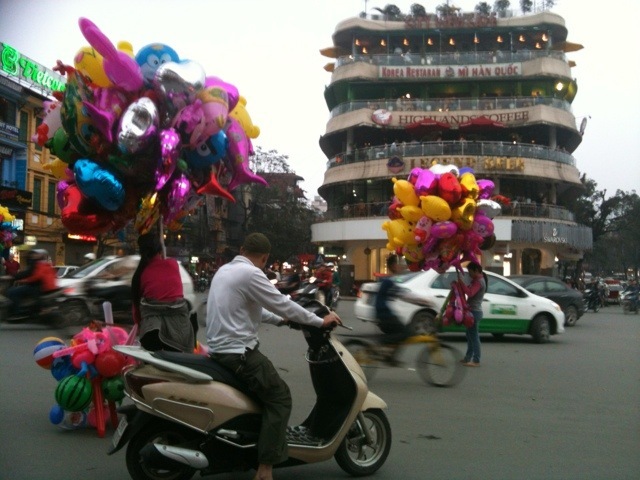 The funny thing is that people on motorbikes would stop to buy balloons and head off holding their purchases as they drove along!